On Tuesday, Sean Spicer held his first press briefing in two weeks, following Donald Trump’s first trip abroad as president. It didn’t go well. As became increasingly clear during the briefing, Spicer no longer has a handle on the White House’s collapsing definition of “fake news.” One minute, it was anonymous sources in news media (except when they talked to Fox). The next, it was factually incorrect tweets (except when they’re about climate change). Spicey should be pretty good at his job by now, which simply requires him to provide an unrelenting defense of Trump’s tweets, whether he agrees with them or not. But after weeks of dismissing all bad press as fake news, even Spicer seemed unsure what the president’s favorite epithet was supposed to mean. Is climate change fake news? Trump is expected to make a decision on the Paris Agreement this week, an intentional commitment to reduce carbon emissions along with 146 other member states. Instead of asking about the international consequences of withdrawal, a reporter asked Spicer whether Trump believes climate change is a result of human activity, a claim he famously denied on Twitter and has since doubled down on. Spicey simply dodged the question, as if Trump isn’t responsible for shaping the environmental policy of the world’s second largest carbon emitter. Is it “fake news” to say Trump is a climate denier? 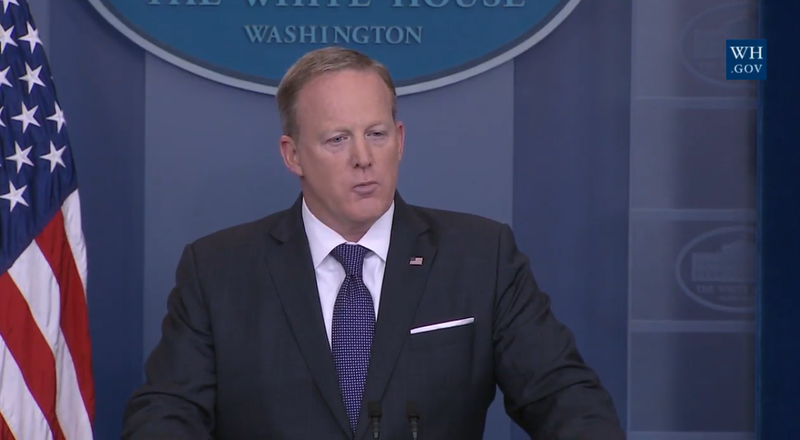 Spicey was also asked to explain two Trump tweets that directly contradicted positions the White House has taken on healthcare and the media. Last week, Trump tweeted he wanted to “add more dollars” to the Republican healthcare plan, the Affordable Health Care Act, even though the AHCA was specifically designed to reduce the amount of money the government spends on insurance. Spicey said that the president has “been very clear” on the topic (obviously he hasn’t) and would “do whatever it takes to make sure that people have quality and accessible healthcare.” So what’s true? That Trump wants the AHCA to cover more people, thus requiring more federal money? Or that the AHCA is designed to reduce the federal deficit, as Paul Ryan has said, meaning Trump’s tweet was completely off-base? Is anonymous sourcing fake news? Recently, Trump tweeted that news stories that reference anonymous, unnamed sources are “fake news,” in reference to reports that Jared Kushner tried to set up improper “backchannel communications” with Russia. But when a reporter pointed out that Trump retweeted a Fox debunk of the backchannel claim that was itself sourced from an unnamed insider, Spicer had to explain why Trump promoted one story with an anonymous source while dismissing another. Spicer, being careful not to confirm or deny the report, said the question assumed “a lot of facts that are not substantiated by anything but anonymous sources that are so far being leaked out.” So anonymous sources aren’t fake news? Or are they? Of course, if Spicer really thinks that false tweets are fake news, then that would make his boss the world’s most prolific publisher. On that point, Spicey, I think we can agree. Fake news is everything. It’s nothing. It’s in all of us.